Below are answers to the most voted for questions in our Spectrum Q&A Thread we posted last week. Thank you for taking the time to submit your questions and voting for the ones you care about most. Also, special thanks to Calix Reneau, Kirk Tome, and Steven Kam for their help in answering your questions. Can we swap the holding cell for other equipment? No, the holding cell in the Hawk is integrated specifically into its design. The Hawk is a small, focused ship. In general, modularity in engineering implies a bunch of things, including piping and plumbing, structural loadbearing, and bunch of other considerations designed to handle different equipment of varied capabilities. That stuff doesn’t come free in terms of weight, cost, or complexity, hence why not every internal space is just automatically modular by nature. How many total weapons, types and sizes, is the Hawk supposed to have? The Hawk has 4 S2 and 2 S1 Weapon hardpoints with 1 small EMP device. Is the EMP from the Hawk as strong as the EMP from the Raven? At present, we expect the EMP on the Hawk to be in the same neighborhood of effectiveness as one of the Raven’s. A balance pass is scheduled for 2018 and this information may change. When will the variants become available that are mentioned in the brochure? 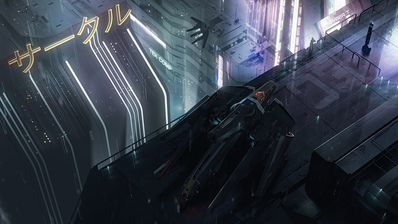 The variants described in the brochure are ships that exist in the fiction of Star Citizen’s universe. Currently, there are no plans to implement these variants. Let’s see how much you all like the original Hawk, for starters :). Will the Hawk fit inside a Carrack? Considering that both ships are in production at the moment, we do not have the final dimensions of each ship and can’t definitively answer this yet. That said, it is unlikely as the Carrack’s hangar is designed to field a ship the size of a snub craft. Brochure mentions gun rack. Where is it located? It’s behind the deployable pilot seat. It was mentioned in the ATV that the prisoner transport pod could be used as a bed for the pilot. Is this the case? How do the defensive features (e.g. shields, armor, countermeasures) of the Hawk compare to other light fighters such as the Gladius, Mustang Delta, and Defender? Anvil designed the Hawk, so as you’d expect it’s reasonably durable, at least as light fighters go. In this respect we plan for it to have tougher armor than the Gladius, Mustang Delta, and the Defender. Its shield generators are presently intended to be similar in performance to those of a Gladius. While the Hawk carries on more armor, the Mustang Delta’s defenses include a larger store of countermeasures. What’s the heaviest armor a player can wear while operating the Anvil Hawk? As is standard for most single-seat fighters, this is a flight suit. The player will be able to store a small personal loadout in the ship (the aforementioned gun rack), so they can quickly gear up for FPS action. Is the Hawk going to be fast-tracked in development or is this going to be further down the road for getting in-game? Generally speaking, smaller ships are simply easier to make, and ships without interior spaces are easier still. 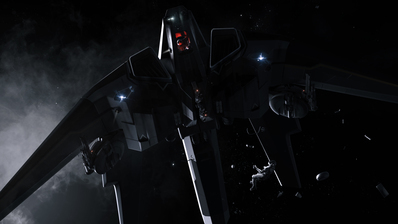 From a development perspective, the Hawk has fewer obstacles to production than larger ships with traversable interiors, and is therefore likely to be in game sooner. 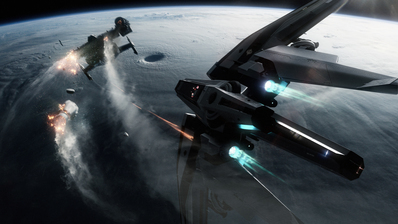 Which loaner will be available until the anvil hawk is flight ready? 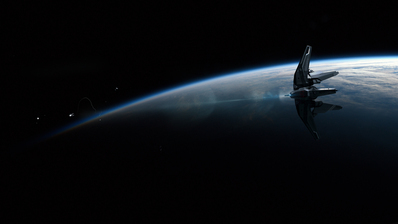 The Cutlass Black is the selected loaner ship for the Anvil Hawk. Is the stated 500 m/s afterburner speed correct? If so, how will the Hawk stop prospective bounties from simply running away? The Hawk is viewed as an entry level ship that focuses on being cheap, reliable, and versatile, and may not be able to handle every bounty – or at the least, may require a little extra tactical prowess to pull it off. As flight balance is an endeavor that will continue throughout the development process, the 200;500 stats should remain as a good comparison point for how the Hawk will perform relative to other ships as stated on the Ship Matrix according to the characteristics of the flight model point in time that it was introduced into the ship pipeline. Remember that as we experiment with the overall flight model to provide a better game experience over time, so too does ship performance adjust alongside it. 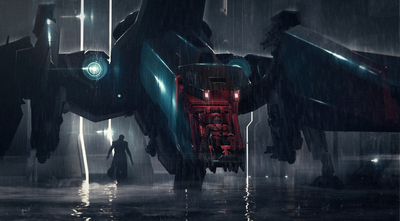 Is the prisoner stowage in the aft of the Hawk being designed for just a single seat, or will it be able to hold multiple bounties as the cells in the Avenger Stalker do? The Hawk’s containment pod accommodates one prisoner. This is an Anvil Ship, but it is still a light fighter. This class of ship relies on speed to survive and win fights. Since it’s already stated to be slower than the Gladius, what other points make this ship a viable choice over it, since the Gladius got the S3 buff? Every ship has its purpose. 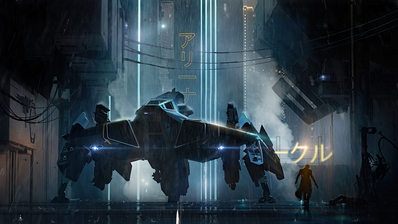 The Hawk is a light fighter with bounty hunting features. There are some missions for which a Hawk is suited that a Gladius isn’t. Even considering their different mission profiles, however, the Hawk has an EMP device, which will play better in certain situations than a limited loadout of missiles (perhaps especially in bounty hunting), and it also has comparable shielding to and better armor protection than the Gladius. Remember too, the benefits of armor protection versus shielding against different types of weapons; although of course one prefers not to get hit, when you do get hit, sometimes you really want that armor. What is the (in-atmo) air speed velocity of an unladen Hawk? African or European? In all seriousness, having the prisoner in the holding pod will not noticeably impact the air speed velocity. Under the latest flight model in testing, at 1 atmosphere and neutral conditions, the flight speed would be around 165 m/s with max safe air speed be around 339 m/s. Why make a bounty hunter ship with no interior? Traversable interiors in general make a ship considerably larger – something you’ve had the opportunity to witness in the development histories of some of our other ships. Larger surface area and internal volume can in turn translate to higher mass (see https://robertsspaceindustries.com/comm-link/engineering/16170-The-Shipyard-Ship-Mass for info on how this affects our ship mass derivations), which quickly runs counter the Hawk’s design aim of a light fighter with a small landing footprint. Without an interior, the Hawk can run lighter, cheaper, and be more nimble. Instead of supports and reinforcements to shore up against the structural weakness of large empty spaces (relative to the size of the ship), those materials are more uniformly dedicated to keeping components and resource pipes firmly in place, making them more dense. This also benefits to the lone wolf nature of a player who only wants to pilot a single-seater bounty hunter ship. What are the correct dimensions for the Hawk? The current stats are: 17m long, 22m wide, 6.5m tall – It’s important to note that the ship is in whitebox and these dimensions may change as it moves through the production pipeline. Kruger Intergalactic P-52 Merlin now available!